To my sur­prise, some old dreams from film stu­dent times have recent­ly become true. Hard­ly 15 years lat­er. 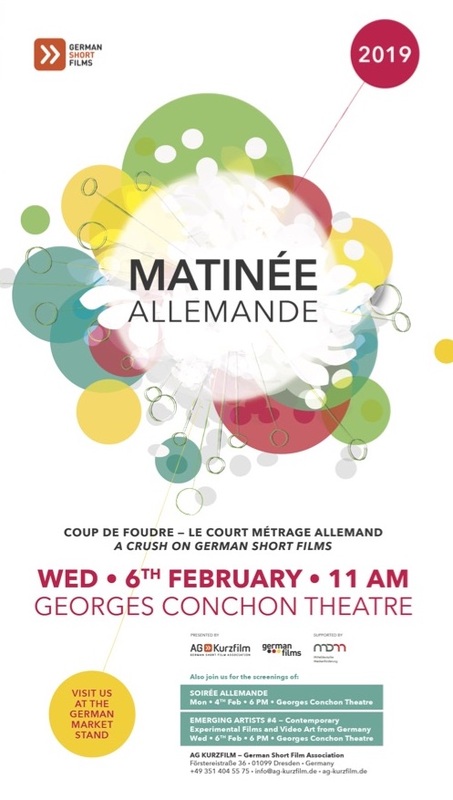 My music video TUTORIAL (ERDMÖBEL) will be shown at the mat­iné mar­ket screen­ing of the Ger­man Short Film Asso­ci­a­tion at Fes­ti­val du cour métrage in Cler­mont Fer­rand on wednes­day feb­ru­ary 6th at 11:00 am. Ready to launch at this years Berlin Film Fes­ti­val TUTORIAL will also appear in the short film cat­a­logue „Ger­man Short Films 2019“ as well as the screen­er-DVD „Ger­man Short Films“ by AG Kurz­film — Ger­man Short Film Asso­ci­a­tion. And last but not least the music video will be screened in the nation­al com­pe­ti­tion of April’s Film­fest Dres­den. More about this lat­er. What an unex­pect­ed joy! Danke, liebe AG Kurz­film!